MB finally found a U-Pick Berry Farm, she's been yearning for some fresh berries ever since leaving NQ. This one was advertised as 30mins from Batemans Bay (on the NSW south coast), so after leaving Batemans for Sydney yesterday, we detoured to the berry farm for a berry feast. We followed the directions given on the brochure, once off the highway we had to drive on an 11km dirt road, normally this isn't a problem but this one was extremely corrugated and rough in some sections, it was quite a ride just getting there, and much longer than the advertised time of course. The ride was worth it though. We got to pick blueberries, raspberries and blackberries. Of course we were told we could taste them but "feasting" was not permitted. We certainly tasted them, many more than we actually picked. 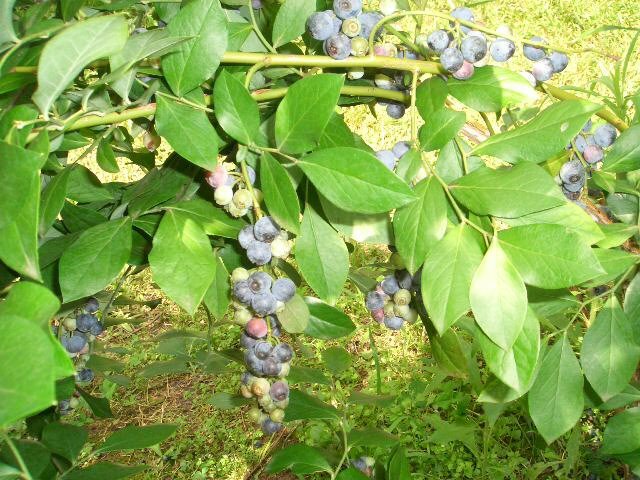 Nothing can compare to the taste of a freshly picked, ripe berry, the flavour is just divine. 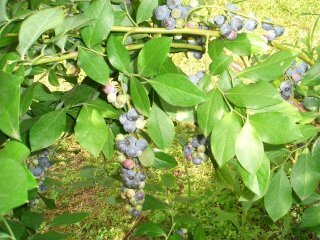 Photo shows a laden blueberry bush. MB also bought some of their white peaches which are also divine, their flavour is out of this world and far exceeds anything that you could buy in the shops. Looks like you enjoyed Sydney. Another fantastic bookshop is Abbeys, near the QVB building. Just massive, and really helpfull staff. Have you seen the Jeeves series with Stephen Fry and Hugh Laurie ? Thanks for taking a dekko at my blog and thanks for the tip re Abbeys, I actually saw them on the Web but didn't get to visit. My partner wasn't letting me out of his sight, he was so worried I was going to load up the car with books and other miscellany. I did manage to find a DVD of the first Jeeves' series, they are hilarious, very true to the books. Needless to say I've devoured the very limited collection of PGW books at my local library. PS Just arrived home 11pm last night after a very long drive.